Another great trip down memory lane recently was BBC2’s “Cradle to Grave” telling the story of Danny Baker’s 1970s childhood, spent growing up in London. 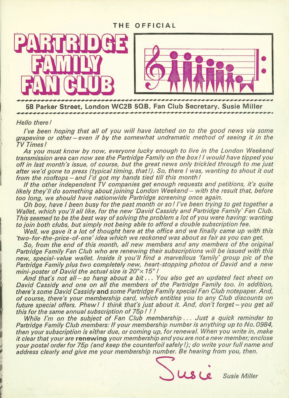 Peter Kay plays Danny’s dad and is always up to some money making scam or another whilst young Danny, short of £100 for a very early video recorder, decides to record most of his LPs onto cassette tape and sell them mail order for £1.00 a pop – a lot of money at the time. Brings back memories of trying to record the top 20 straight off the radio on a Sunday night, and trying to make sure everyone else in the room kept quiet ! It was always a bit anti-climatic after the No. 1 spot finished and “sing something simple” came on. That was usually a sign for my mum to get the ironing board out and I had to go and get a bath, in readiness for the school week ahead! Anyone out there remember the Partridge family? 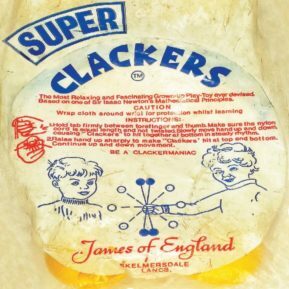 Subbuteo, Mousetrap, Buckaroo …not to mention the famous but extremely dangerous “Clackers”. They were eventually banned at my school ! Talking of which, there is a reproduction of their packaging in our 1970s Childhood pack – note the Caution “Wrap cloth around wrist for protection whilst learning”. Another facinating read is the copy of “Superstar’72” magazine. All the big names of the day including The Partridge Family, Slade, The Osmonds, T. Rex, The Monkees and so on …. 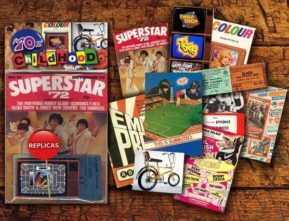 1970s memorabilia pack – bring back the 70s!